Build your own medieval catapult with this fun and educational kit. Make your very own Medieval catapult with this fun and easy-to-use kit. 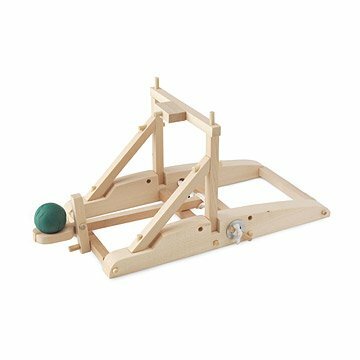 This mini wood version can be built in around an hour or two and can shoot a ball over 15 feet! Adjustable pads on the crossbar allow you to change the trajectory angle. The rope, strung through the middle gives great power to the swing arm. Made in China. This catapult was right on target as a gift for my nephew! Immediately started planning list of what would be catapulted! I purchased this as a Father's Day gift for my dad and he absolutely loves it! He's a woodworker through and through, but still enjoyed putting this little project together. I was pleasantly surprised by the accuracy as well as the distance this little model can launch. The toy is fun for the child, however, it seems a little too light and fragile. wasn't the rip into it excitement i was hoping for but it still throws pretty far. the kiddo seemed to like it and shipping got it there in a satisfactory time period. Gave this to my boyfriend for Valentine's Day. He told me at Thanksgiving he wanted to build a catapult, so this was the way he could do it before Thanksgiving this year! Really works! And is accurate! we bought this as a teacher's gift. Since we did't know if he liked assembling, we assembled it. Directions could be better, but we got it. It works better than we thought. It's aim is accurate. We even customized it (painted flames). The teacher loves rennaiessance fairs, and loved this gift even more. He'll use it in class to demonstrate physics, and perhaps shoot wads of paper at unruly students-just a guess. this is a great gift! I bought this for my fiance, because he still acts like a big kid, so I knew he'd love it! :) It didn't take him long to build it, and he's been having fun with it ever since! I thought it would be bigger, but he didn't seem to mind at all. I bought this gift for my nephew's 9th birthday. He is into building model airplanes and legos, so I thought this would match his interests while also being a good surprise. He loved it and started building it right away. This catapult is awesome. I have no idea if it's historically accurate like the description says, but it is definitely fun to play with.